Miho Museum is nestled in a beautiful forest complex designed by renowned architect I.M. Pei, only a short trip away from Kyoto. Located in Shiga Prefecture, Miho Museum is meant to mirror Shangri-La–an earthly paradise described in Chinese poet Tao Yuanming’s poem, “The Tale of the Peach Blossom Spring.” Not only is the Museum itself stunning, the journey there is just as magical. Miho Museum has three exhibition sessions (Spring, Summer, and Autumn). I visited in Autumn so I saw stunning fall foliage throughout my trip. But since the Museum grounds are full of cherry blossom trees, Spring is a stunning time to visit as well. To visit the museum, you go on a Spirited-Away-like journey: there is a Miho Museum Bus from Ishiyama Station (a short ride from Kyoto Main Station), that takes you on a quiet ride up the mountain where Miho Museum is located. Directions: Take the JR Tokaido Line from Kyoto Station to Ishiyama Station. Once you exit the JR station, go to the bus stop (1F) and take Teisan Bus 150 (Miho Museum Bus) to the Miho Museum which should be the last stop. The bus will drop you off at the entrance/reception area where you can purchase tickets. From there, you can take a museum shuttle or go by foot to the museum entrance (~10 minutes; highly recommend if you want to take in the beautiful tunnel leading to the Museum). The train ride from Kyoto to Ishiyama Station is a great way to see suburban Japan (JR Tokaido Line). Next, bus from Ishiyama Station to Miho Museum (~1 hour) and quietly enjoy the mountain views. After buying your ticket(s) at the reception, I’d recommend walking to the Miho Museum. It’s quite a short walk and the tunnel itself feels out of this world and truly like a magical journey. Steps up to the Miho Museum. When I.M. Pei designed the museum, he purposefully buried the Museum IN the mountain. That’s why the entire museum feels leveled with the trees and surrounding scenery. With two floors, this central walk way connects the two wings. If you peer down to below, it’s a great way to see the whole mosaic art piece on the first floor. The way the light filters through the entire museum in the late afternoon is just stunning. The main hall when you walk in–the ceiling allows natural light to flow through while creating beautiful shadows on the floor. The Pine View Tea Room is open from 10:30am to 5pm so if you have a chance, definitely enjoy some afternoon tea or light food here while taking in the surrounding views. 和菓子 Wagashi: Traditional Japanese sweets and hand-whisked matcha. Since I visited in Autumn, the seasonal wagashi was kuri (chestnut). As the name suggests, the Pine View Tea Room has outstanding views of pine trees (no doubt all carefully maintained judging by their beautiful shapes). The ceiling’s geometric lines are just so pleasing to look at. 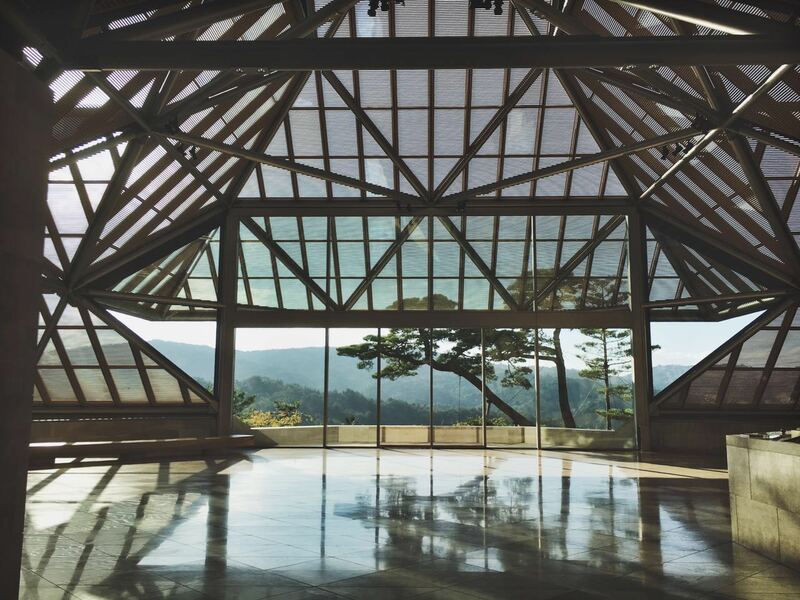 The main hall of Miho Museum offers an unparalleled view of the Valley of Shiga. From these windows you can spot a bell tower in the distance; that is I.M. Pei’s first design for Mihoko Koyama and the Shumei organization. S P I R I T E D A W A Y: On your way out, the doors of Miho Museum offers you a glimpse of the tunnel separating you and the outside world. The Miho Museum was designed by I.M. Pei for Mihoko Koyama, to house her Asian and Western antiquities. The permanent collection is very special. Highlights include the Standing Buddha and the Floor Mosaic depicting Dionysos’s discovery of Ariadne. I was lucky to visit during Autumn 2016, as both the North Wing and South Wing had special exhibitions. In the South Wing, Miho Museum’s collection of ceramics and paintings by Ogata Kenzan (1663-1743) were on display. Kenzan ware and dishes are just simply stunning. Truly, they demonstrate how plating is a defining feature of Kyoto kaiseki’s identity. In the North Wing, “Jewels of the Mughal Emperors and Maharajas” was an incredible display of Al Thani Qatari royal family’s collection. Pink Agra diamonds and Diamond Turban Jewel are a few examples of gems in this dazzling collection. The exhibition itself was also fascinating, weaving an eye-opening narrative of how Indian unmounted jewels inspired Cartier’s designs in the 1920’s. Overall, I was impressed by the stunning collections, architecture, space, and scenery. Miho Museum is an absolutely must visit if you are in the Kyoto area. Don’t let the trip to the museum prevent you from visiting–it’s part of the journey and absolutely worth the experience. *The Miho Museum is only open during Spring, Summer, and Autumn due to weather conditions and exhibition schedule. Check their website for exact opening times. The next exhibition date as I write this post, is March 18th-June 18th, 2017. Wow – such a beautiful museum and I feel like I was visiting it with you. Thank you for sharing! thanks for reading! definitely visit if you get a chance, it’s a stunning place.